Things on the technological front have been functioning less than optimally for the last few weeks. Grandpa is setting up his office out here on the farm in their little studio apartment, and in the midst of trying to get internet out here for him, we currently don’t have it in our house or with our computer. Whenever anything like this happens, I realize how many little things in our day to day we use the computer for. For better or worse. It is about the only place I write, although I am trying to resurrect both the paper journal and letter writing in my life (not very successfully I should add, because handwriting happens so much slower than both typing and thinking, and is often illegible afterwards). It is for some odd reason where we store all of our phone numbers since we don’t have cell phones…a file we started a while ago and meant to print out but haven’t. It is our main means of communicating with everyone, we rarely make a phone call anyways. From our business to our day to day planning of park trips, the back and forth of e-mails is how we do it. It is where we go to listen to music, although our oldest son’s newfound love of the CD, and specifically used CD’s and our lovely used CD shop downtown, have rekindled my own past love with old record shops and buying music and holding it in my hand. There is just so much out here that we can connect to on the web, more than we could ever hold in our hands. Like I said, good or bad, it simply is. So for us, I can’t say the two weeks of spotty availability to the web have been nostalgic or calming or refreshing, more of a hinderence in getting along normally. To top it off, something happened to the camera the last time I let the big boy take pictures and so I couldn’t get any photos from there onto here. Finally, we had to delete everything and get help from the farmer to figure it out. Without a picture, what is a blog post? It is now hard to let the words carry themselves, even though that used to be the way I liked it. Just another thing that the computer has changed. I used to hate that photos were such a huge part of blogging because I didn’t take photos very well. Now, I have really come to love the way they expand the story and have practiced enough to take a shot that is decent enough to open up our story. Still, when there are no photos available, for whatever reason, are there no words to share? Of course there still are, but as you can see, no posts were made in that interem, so now I feel a strange dependence on the camera, again, for better or worse, I am not sure. Anyways, once the camera situation was fixed, Olorin quickly came along and asked to take more pictures (he’s getting his own camera for his birthday, thank goodness). 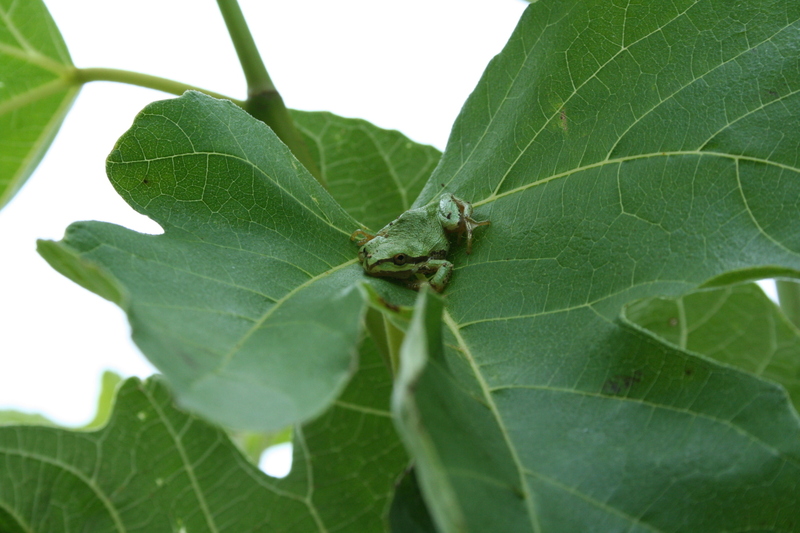 And since it had been so long since I updated over here and I had lost all the pictures I had taken for the last few weeks, I asked him if I could use his picture of a frog tucked into the leaves of the fig tree, a sight spotted while we were picking the last of this year’s strawberries Tuesday night, and came on over for a mini farm update. *planting all of our winter brassicas: purple cape cauliflowers, rudolf and purple sprouting broccolis, collards, regular heading broccoli, more kale (always, more kale! ), radicchios, and of course, cabbages! I keep thinking, we are almost done planting for the year, and then we can relax a little; but really, we will be planting through August, although most everything will be in by the end of this month. * loving all the space we have to plant in for the fall thanks to both our neighbor’s tractor work on the farm and some hired tractor work out at our leased growing space–more than we have ever had to work with! Even though summer may be late or never this year, meaning all of those crops we grow only in the summer will arrive late, we will undoubtably have a really big late summer/early fall, with loads of food. *wondering if all of that will make up for having less food in late spring early summer than we would have liked? We can only hope! *moving on from strawberries, as wonderful as they are, to gooseberries from our place, wild cherries galore but almost gone, and this week, blueberries from our favorite blueberry patch! *harvesting the very first “summer” crop, green beans, dragon’s tongue! *constantly telling different stories of what we might do differently next year, where we will take the business, what we need to focus on, invest in, etc, etc. This is an amazing process that I am just now, five years in, able to recognize as it happens. Through the year, as we observe the weather and its effect over the last few years, see harvests unfold, markets go through their season,discuss customer buying preferences, CSA feedback, and how our family life is working in the midst of it all, we begin imagining the next year in various ways, over and over again, until we usually finalize our new plans around for the coming season by the end of the year. This morning I wondered if the farm would ever just be a certain way, settled as a business, but realized that no business is probably ever like that, at least if it wants to continue to be successful. *trying to think very positively about the extremely mild summer we are experiencing. For example, seeds started in July can be a real trick, keeping them as wet at they need to be in either a greenhouse that is really hot or outside where it is really hot. No worries about that this year! Also, most people seem to thrive when the temperatures are in the seventies, and as much as I feel like I thrive when it is hot and I am sweating while I weed instead of thinking about getting a sweater, I am thankful we are comfortable and hope that those folks who are dealing with extreme heat right now soon get some of that same comfort. *getting ready for our oldest son’s tenth birthday and absolutely becoming charmed with the new phase of his development as much as I am equally overwhelmed with emotion at the end of his whole babyhood, because let me tell you, at ten, it is nearly gone! All of this and many, many other small little bits of life have been happening. The baby is crawling! We are frantically trying to rearrange the home to suit this new little guy on the move. Parks, lakes, play dates, new friends. Sweet and tart wild food, market day socializing, quiet summer night frog hunts. Playing daddy elves while he isn’t looking and weeding places like the kohlrabi bed, those that don’t make his most important to do list, but need to be done just the same. In the meantime, another year is passing in ways both wonderfully the same as we go through another season on the farm and always different as it unfolds and we grow, all of us, a bit more. I hope that computer troubles aside, I can share more of the season with all of you before it is gone. ← Make hay while the sun shines! oh I love to hear about your plantings and the very real things that have an impact, like a mild summer and the consequences in harvest times and quantity. Fascinating!